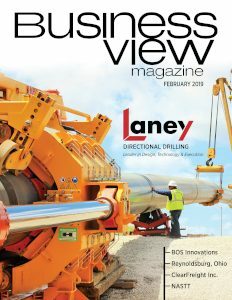 Business View Magazine interviews representatives from Akron, Ohio as part of our focus on best sustainable practices of American cities. Akron’s sewer system was typical of many built in American cities in the first part of the 20th century, where water from storm drains that ran into underground channels combined with the sewage that flowed from domestic, commercial, and industrial sources. And in the early 1900s, that technology was considered a vast improvement over sewers that ran freely into natural waterways. But unlike modern sewer systems that separate storm runoff from sewage, these combined sewer systems were designed to overflow during heavy rains, with the expectation that rain water would, at least partially, dilute the sewage before it entered an outfall pipe and into the river. However, over the years, as the amount of storm runoff entering Akron’s combined sewer system grew – mostly because of continuing urban development that stymied the natural filtering of rain water through soft soils that then collected in underground aquifers – the frequency and volume of these combined sewer overflows (CSOs) mounted. 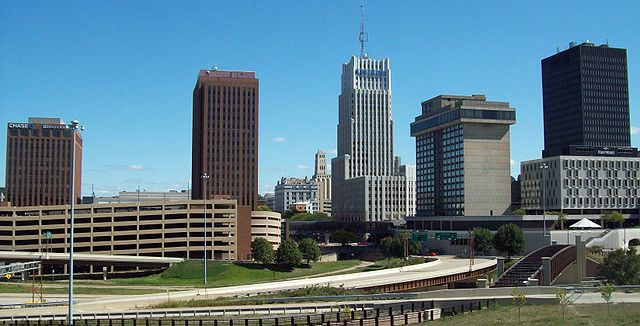 There are two ways in which a city can stop CSOs: increase the capacity that it has to hold and process the sewage runoff, and/or cut back the volume of rainwater and stormwater that gets into the bowels of the city’s sewers, and since 1987, Akron has spent more than $390 million to improve its sewer system, including millions of dollars on engineering studies and upgrades to its wastewater treatment plant. In 2006, the city completed construction of a $23 million storage basin on Cuyahoga Street, which holds 9.5 million gallons of water and sewage from the combined sewers until it can be safely treated when the rain event ends. 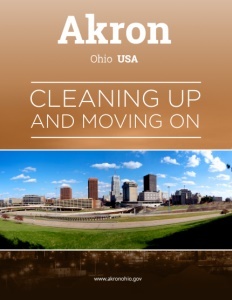 This project alone accounts for 33 percent of the volume of overflows within Akron’s system. Currently, the City of Akron is under a consent decree promulgated by the Environmental Protection Agency (EPA) to revamp its sewer system by 2028, to stop CSOs from entering the Cuyahoga River under normal conditions. When finally completed, the project is expected to produce the greatest environmental benefits since the first Europeans moved to the east side of the Portage Path in 1805, and began polluting the water along the Little Cuyahoga River at Case Avenue with their woolen and grist mills. The City’s CSO “Long Term Control Plan,” which was submitted to the federal and state EPA’s, and is being managed by the Akron Waterways Renewed! Project Management Team, will improve the sewer system by attempting to achieve zero untreated overflows in a typical year, thereby improving water quality in its streams, canal, and rivers. Some of the money will be spent separating sewer lines from storm water drains. Where it is more cost-efficient, large basins will be constructed to hold wet weather flows until treatment can take place in an orderly fashion. In late 2014, the City broke ground for the Cascade Village Storage Basin, the first in its series of projects that will ultimately become the largest single investment – some $1.4 billion – in city infrastructure in Akron’s history. $300 million – the largest single project – will be the construction of the 6,000-foot-long Ohio Canal Interceptor Tunnel. In all, the project includes seven sewer separation projects, two large tunnels, ten storage basins, and improvements to the Water Reclamation Facility. “Much like a lot of cities in the U.S., our Chamber of Commerce, our city, and our county, have been focused for the last 25 years, primarily, on job attraction and investment attraction, with some success, to be sure,” he continues. “Akron came to prominence through the rubber industry – making tires. A good section of our economy is still related to the auto industry. Goodyear Global Headquarters is here; we have Bridgestone Americas Center for Research and Technology here, and a lot of companies that deal with the automotive industry, tool and die companies, manufacturers, and advanced materials, like polymers. Then we have an incredible amount of middle market firms in the Akron metro area that run the gamut in terms of their industry focus – still tied to the manufacturing base and the auto industry. So, we still have a good portion of that. We also have universities and hospitals; ‘heads and meds’ are still a key driver of our local economy. “But, as our economy has changed, and continues to change, we have to change with it. And so, with a new mayor, a new county executive, and new leadership at the Greater Akron Chamber, we seized that opportunity to put together a conversation among the three partners: Do we want to seek a new economic development strategy? The answer was ‘Yes.’ Were we willing to give up a few sacred cows in order to get greater impact for our region and our community? And the answer was ‘Yes.’ And that led to a process where we engaged two non-resident fellows at the Brookings Institute in a market analysis and strategy development process to create something new for the City. “The product that we ended up with was pretty tremendous. We surveyed our local economy, put it in context with the national economy, and found that we could not double down on attraction – that’s not going to move the needle for places like Akron. We certainly want to be ready, and we need to be ready for business opportunities that do come along, but it’s a shift to focusing on growing what we have – making sure that the top 25 employers are taken care of, but also going back the other 100 or 150 middle market firms that are driving the majority of our growth. We weren’t set up to support those companies, and we’re now working to completely shift our entities to focus on them. Hardy also talks about Akron’s downtown renewal schemes: “When Mayor Horrigan came into office in January 2016, one of the first things he did was partner with our Downtown Akron Partnership to put together the framework to create a comprehensive vision and redevelopment plan for downtown. We never really had one that took into account all the stakeholders that need to have their voices heard in a process like that. That initiative completed at the end of last year. So, we have now, for the first time ever, a comprehensive, downtown redevelopment plan. “I’m happy to say that we closed, recently, on probably the most significant redevelopment project downtown in 10 or 15 years, which we call the Bowery Project. Akron’s history is unique in that we are a canal town; we were built up around the Ohio and Erie Canal and that canal still flows through downtown, so there’s a historic block of downtown Akron that is anchored by the Akron Civic Theatre, which is one of our largest cultural amenities. It’s been blighted for the better part of 20 years. The City owned it for the last 17 years and has been working to find a development team that can make that project happen. And we got it done. Check out this handpicked feature on Reynoldsburg, Ohio – The city of respect. KB BioEnergy, Inc. is a waste to energy company specializing in biosolids. 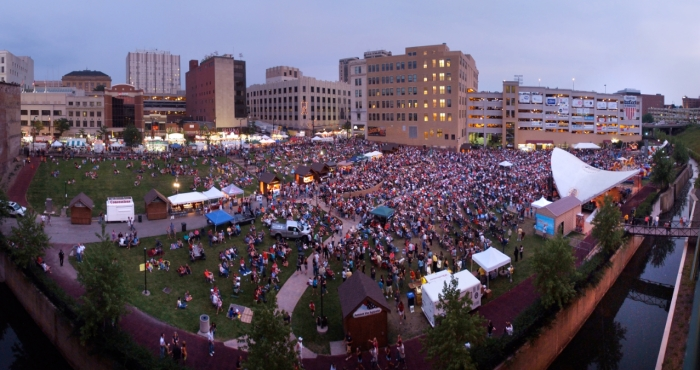 We have held a public-private partnership with the City of Akron since 1989. While creating renewable energy, we strive to protect and improve the environment we live in for current and future generations.